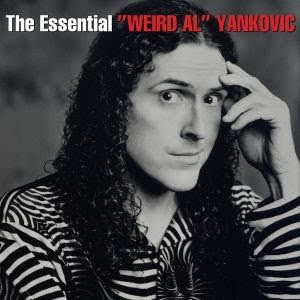 If You Have To Ask: 'Bedrock Anthem' (Red Hot Chili Peppers parody song) features on Weird Al Yankovic's latest Great Hits "The Essential "Weird Al" Yankovic"
'Bedrock Anthem' (Red Hot Chili Peppers parody song) features on Weird Al Yankovic's latest Great Hits "The Essential "Weird Al" Yankovic"
"Bedrock Anthem" is a song by "Weird Al" Yankovic which was featured on his 1993 album Alapalooza. It is parody of "Under the Bridge" and "Give It Away" both by the Red Hot Chili Peppers. The song also appears on the soundtrack album for the 1994 live-action movie version of The Flintstones, with a portion of the song played during the end credits. The song portrays the narrator's desire to live in Bedrock, the setting of TV's The Flintstones, citing such perks as being the first Rolling Stone subscriber. The song features an audio clip of The Flintstones, which makes a corresponding appearance in the video. Yankovic stated that, "I knew there was a Flintstones movie coming out, and I figured that for once I'd have my song out before the actual phenomenon. So I got to predate the movie by seven months. I'd always wanted to do a tribute to the Flintstones because I think they're a big part of pop culture. I did a lot of research, really immersed myself in the Flintstones. I watched over 100 Flintstones episodes, because I had to not only re-familiarize myself with the characters, I had to find actual sound bites and animation from the series to use in the song and the video." The "Bedrock Anthem" music video is a parody of both the "Under the Bridge" video and the "Give it Away" video. "I didn't think it was very good. I enjoy Weird Al's things, but I found it unimaginative. It wasn't that great. Yabba Dabba Doo. I like Weird Al and everything. But you know everyone is hit or miss, except for me, of course." Is John Frusciante still in The Red Hots?